Tradition and familiies on the beach in Kitty Hawk, July 4, 2015. The 4th of July is all about tradition. Certainly the tradition of fireworks, hotdogs and hamburgers . . . but it’s more than that, especially on the Outer Banks where much of that tradition is as simple as a day at the beach. We almost lost a part of that tradition yesterday but there was just enough sunshine and the timing was just right to get in the fireworks. The day started hot and humid and perfect for a dip into the sea, and the beach was packed from 10 o’clock on, mostly with families. One of the great things about the tradition of being at the beach is a father can take his son or daughter into the surf play with then on a boogie board and be every bit as childlike as he wishes . . . and no one thinks he’s being anything other than a good parent. Just beyond the surf, kayakers and SUP paddlers were drifting by, the light wind from the south and flat seas made for almost perfect conditions. On the beach families were setting up tents with American flags flying from them, ready to grill burgers and dogs and celebrate legacy of freedom that is unprecedented in world history. It was a close call for the fireworks in Kill Devil Hills an Nags Head. Storms rolled through the area in the afternoon-Nags Head especially was hard hit-but the air cleared about 6:00, the next storms didn’t roll in until 11:00 and it was a perfect evening for a spectacular fireworks display. 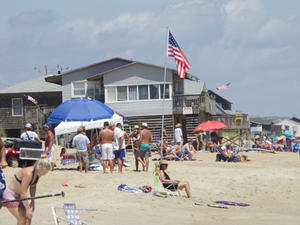 The 4th of July is a day filled with tradition on the Outer Banks; for some it’s been a way of life for years. For others the tradition is just beginning. Either way, it’s worth being a part of it.